Cheltenham Racecourse ushers in the New Year with its traditional fixture on Thursday, January 1, 2009, comprising a fantastic seven-race card that features the £55,000 Grade Three skybet.com Handicap Chase (2.10pm), run over two miles and five furlongs. The Nicky Henderson-trained Fondmort won the prestigious contest in 2006 en route to a course and distance follow up in the Grade Two Ryanair Chase at that year’s Festival, while Too Forward, trained by Carl Llewellyn, won the 2007 renewal. Last year, the David Pipe-trained Vodka Bleu prevailed, getting the better of Patman Du Charmil by two and a half lengths. 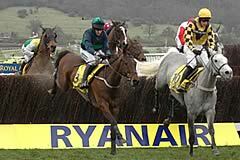 The 2003 running was a particularly high-class affair with the Ferdy Murphy-trained Ballinclay King, previously a winner of the Grade One Maghull Novices’ Chase at Aintree, landing the spoils from 1999 JCB Triumph Hurdle victor Katarino, while third place went to the gallant Grey Abbey, who was subsequently the top-rated staying chaser in Britain in the 2004/2005 season. The £35,000 Grade Two Aquanti “Dipper” Novices’ Chase (1.40pm) is proving to be one of the most informative contests for novices, having been won by top-drawer performers since it was first run at Cheltenham in 2005. My Way De Solzen scored an impressive 17-length victory in the two mile, five furlong contest in 2007 before winning the Grade One Irish Independent Arkle Trophy at The Festival in March. Alan King’s charge was also a top-class hurdler and won the Grade One Ladbrokes World Hurdle over three miles at The Festival in 2006. The Listener (right) has established himself as one of the best chasers in Britain and Ireland. The Listener has established himself as one of the best chasers in Britain and Ireland since triumphing in the 2006 renewal of the Aquanti Group “Dipper” Novices’ Chase, which he took by three quarters of a length from Napolitain, with subsequent Grade One RSA Chase hero Star De Mohaison in third. In 2008, it was the Philip Hobbs-trained Lead On who prevailed, while the first Cheltenham running went to My Will. The £25,000 Centaur Handicap Chase (1.05pm) is run over an extended three and a quarter miles and last year’s winner Irish Raptor, trained by local handler Nigel Twiston-Davies subsequently finished second in the Topham Chase over the Grand National fences at Aintree. The 2007 contest went the way of Cornish Rebel, who held The Bajan Bandit by a length and three quarters for champion trainer Paul Nicholls. The quality of the day is further enhanced with the running of the extended two and a half-mile £25,000 Steel Plate And Sections Hurdle (3.20pm), which was won 12 months ago by the classy Blazing Bailey, who subsequently won at both Aintree and Punchestown as well as finishing fourth in the Ladbrokes World Hurdle, while the other three winners have been Flight Leader (2007), The French Furze (2006) and Westender (2005). Hills Of Aran, trained by Keith Goldsworthy in Wales, saw off Hennessy to collect last season’s renewal of the £25,000 Unicoin Homes Handicap Hurdle, run over three miles and due off at 2.45pm. The day kicks off with the £15,000 Club 16-24 “Help For Heroes” Ball National Hunt Novices’ Handicap Hurdle over two miles and a furlong, which last season went the way of the Alan King-trained Oh Crick. The concluding race is the £17,000 Listed EBF “High Sheriff of Gloucestershire’s” Millennium “Junior” Standard Open National Hunt Flat Race (3.55pm) over a mile and a half, which was won last season by Lord Generous, trained by Helen Lewis and out of that great Cheltenham performer Lady Rebecca. Run at Newcastle prior to 2005.